Thomas Piketty captured something essential in the post-Lehman mood with his study of income and wealth differentials in the developed world. More’s the pity that his policy recommendations are misguided, in part because he missed the worst kind of inequality. During periods of economic crisis and slow growth, concerns about inequality loom larger than in times of prosperity. This was true after the 2008 financial collapse, when movements like Occupy Wall Street mobilized to fight the so-called 1 percent that was supposedly robbing the other 99 percent of society. The post-crisis preoccupation with inequality found its most vivid analytical expression in the work of the French economist Thomas Piketty. When the English translation of his Capital in the Twenty-First Century was published in 2014, the weighty academic tome received almost reverential treatment from many readers (usually on the left), but also very rapidly stirred up a heated professional debate. On one level, the work was nearly perfectly in tune with the sensitivities of the post-crisis era, when Oxfam, the United Kingdom-based development charity, could shock the public with a world poverty report claiming that 62 billionaires controlled as much wealth as the poorest 3.6 billion members of humanity. Mr. Piketty even figured in the United States presidential race when he endorsed Senator Bernie Sanders, a contender for the Democratic nomination. Because Mr. Piketty’s book encapsulates so many of the ideas and policies behind the “fight against inequality,” the professional critiques of its arguments repay close analysis. They reveal much that is misleading or mistaken in current thinking on the subject, along with more dangerous aspects of inequality that have been neglected. The central idea of Capital in the Twenty-First Century is that capitalism naturally generates a vicious circle of inequality. Because capital incomes grow faster than the economy (and thus wages), the rich can only get richer. The author warns that inequality in both incomes and wealth is returning to levels not seen since the Gilded Age of the late 19th century. The inequality trend described by Mr. Piketty has a “U shape,” suppressed from the 1930s to the 1970s by the effects of two world wars, the Great Depression and “progressive” tax policies that equalized incomes and wealth. Deregulation and the adoption of more free-market policies in the 1980s then made inequality rise again, according to this argument. The common thread of Oxfam’s or Mr. Piketty’s analysis is a vision of the economy as a zero-sum game in which one man’s gain is another’s loss, reminiscent of a Marxist class struggle. In such a “fixed-pie” economy, social mobility is minimal. The rich are rentiers who automatically collect capital gains or super-managers siphoning money from shareholders. The poor cannot accumulate capital and indeed should not, because in their case investing is too risky a game. In the real world, things are quite different. The economy is not a fixed pie. Mobility exists in both directions, meaning that the rich can go broke. Capital accumulation is far from automatic and usually requires some talent. The rich are not only heirs to vast fortunes but, more and more often, successful entrepreneurs and managers who create value for their companies, their customers and society. Creative destruction means that industry leaders must continually remake themselves or perish, like Kodak and Borders. The theoretical assumptions required to make Mr. Piketty’s model of cumulative divergence work have been severely criticized by such economists as Matthew Rognlie. Other researchers have shown the absurdity of the cumulative process he describes, which would logically lead to the 1 percent seizing all available wealth in less than a generation. Even as Capital in the Twenty-First Century won praise for its empirical scope, many researchers took issue with its statistical apparatus. For example, figures drawn from Internal Revenue Service forms are meaningless unless one takes into account the evolution of the U.S. tax system. Changes in tax law during the 1980s had a profound impact on income declarations. Lower marginal income tax rates meant companies could pay more in wages and less in other forms of compensation, while affluent taxpayers were more likely to declare income on their individual IRS forms rather than keep it in special-purpose companies enjoying lower tax rates. Similarly, lower taxes on dividend income encouraged investors to invest in higher-risk, higher-yield assets. To look at income through tax data is to risk succumbing to an optical illusion. Mr. Piketty’s other questionable decisions are to include housing assets in “wealth” (ignoring distortions created by scarcity-generating urban policies), omit redistributions and other public benefits from poor peoples’ incomes, use an inappropriate deflator to account for the evolution of prices and real incomes, and ignore changes in household size and structure. Each of these “selection choices” has been shown to bias the study’s results. If corrected, the cumulative rise in U.S. median household income would amount to 36 percent between 1979 and 2007 – not 3 percent, as the French economist claims. Other economists have criticized the inconsistent methodology used to help make Mr. Piketty’s inequality curve “stick” to its U-shaped pattern, along with his inclusion of the communist world in an analysis supposedly devoted to capitalism. Most problematic of all may have been the failure to perform any econometric tests of the r>g theory; other researchers who used various sets of data have not been able to verify its accuracy. Policies based on such unreliable data should be treated with extreme caution. Radical tax policies, including a global levy to combat inequality, would inevitably destroy the incentives to create wealth and thus lead to increased poverty. Yet this is not to say that inequality is a matter of indifference for economic development. In fact, there is a category of inequality that seriously inhibits wealth creation and the reduction of poverty. Oddly, it is rarely given much attention by advocates of social justice. Their nearly exclusive focus on inequality in outcomes (wealth and income) causes them to overlook the importance of inequality in procedures – the economic and social rules that favor certain groups or professions over others. From the standpoint of economic growth and political stability, this form of inequality is much more pernicious than differences in wealth or income. Using links to political power for economic gain is the most pervasive example of such inequality. It can take the form of connections allowing preferential treatment, shielding a form of “corporatism” from exposure to market competition. Recent examples include the violent protests of licensed taxi drivers against Uber and the privileges enjoyed by public employees versus their private-sector counterparts in Greece and France. It is all too easy for politicians to protect the income and status of well-organized groups by spending taxpayers’ money. Such collusion undermines the rule of law and institutionalizes inequality. It distorts incentives for insiders (by fostering rent-seeking) and for outsiders (by discouraging honest effort). Inequality that derives from process rather than outcome fundamentally skews the rules of the game. In some countries, institutional collusion has become so pervasive that the economy’s main function is to extract wealth for the benefit of a few. Sometimes these privileges can be much more subtle. In Mr. Piketty’s own country, giving favors to “national champions” such as Minitel or Bull is almost part of the DNA. This has seldom worked to the benefit of the French economy. Procedural inequality is illustrated by the “social privileges” enjoyed by a caste of civil servants and employees at state-owned companies, along with members of “closed professions” such as notaries. Perhaps the worst offenders are elected public officials, whose avid collection of perks has fueled a populist backlash against the political establishment. The financial crisis and recent developments in the global economy (especially the rise of a state-subsidized renewable energy industry) have created new opportunities for cronyism. In the U.S., big food and drug companies are regularly accused of regulatory capture of the Food and Drug Administration (FDA). Such procedural inequality can stifle competition and innovation by excluding small businesses – all with the government’s stamp of approval. Such political connections extend to the heart of our financial system. To a large extent, central banks have used unconventional monetary policies to abolish the price of time. The result has been a “great deformation” of capitalism that misdirects investment into a bubble economy and discourages savings amid a prevalent attitude of short-termism. This collusion between central banking authorities, big banks and politicians is profoundly disturbing. It corrupts the basic allocation of capital and labor in modern society by making irresponsible banks “too big to fail” and shielding irresponsible governments from accountability and default. In this sense, the Occupy Wall Street protesters were right – if only they had looked beyond greedy “banksters.” The unmistakable effect of cronyism in the financial/monetary nexus has been to expand the gap between rich and poor. 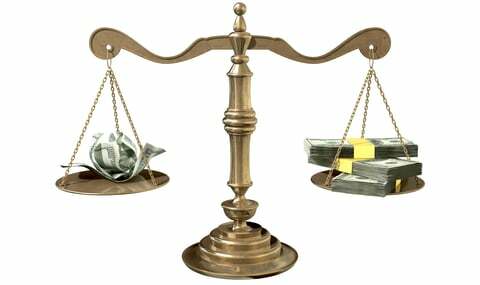 Financial markets on monetary steroids allow investors to artificially multiply their wealth, while the less fortunate must be content with zero interest on their savings. Curiously, inequality fighters are prone to applaud such monetary policies. The current policy debate largely ignores the crucial distinction between outcome- and process-derived inequality. Instead, in countries such as France, people just want their fair share of privileges. Economy Minister Emmanuel Macron was one of the rare politicians willing to tackle the problem of closed professions, but his efforts were hamstrung by an almost worshipful attitude toward status, which is nothing more than institutionalized procedural inequality. People with this mindset tend to blame their problems on “market capitalism” rather than “crony capitalism.” Instead of openness and transparency, they want even more protection. This mentality is making a comeback even in America, as both the Republican and Democratic presidential primaries demonstrate. Donald Trump wants to erect a wall to protect white Americans from “dishonest” Mexican competition. Bernie Sanders wants the top 1 percent to pay back the struggling middle class. In the end, both want to entrench procedural inequality. Since inequality has become a fundamental political issue, its hijacking by populists does not bode well for the stability of Western democracies. Building protective walls and chanting “eat the rich” will not do much to level the playing field.